Want to connect with Walli? 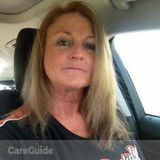 HI MY NAME IS WALLI (FEMALE) AND I HAVE BEEN IN Childcare FOR OVER 25 YEARS. I SPECIALIZE IN PREEMIES, NEWBORNS AND MULTIPLES. ALTHOUGH I LOVE AND CARE FOR ALL AGES. I CARE FOR THEM IN MY IMMACULATELY CLEAN, PET FREE, SMOKE FREE HOME. I CARE FOR CHILDREN AS MY OWN AND MANY TIMES AROUND THE CLOCK FOR PARENTS WHO TRAVEL OR HAVE OTHER OBLIGATIONS. IF I AM NOT BUSY WITH OTHER CHILDREN I AM OPEN TO COMING TO YOUR HOME FOR DATE NIGHTS AND SUCH. I AM AN AVID READER AND I SHARE THAT WITH EVEN MY NEWBORNS, EARLY CHILDHOOD EDUCATION IS VERY IMPORTANT TO ME WHICH MEANS PLAYING AND TUMMY TIME. I LOVE WHAT I DO AND I TAKE GREAT PRIDE IN IT. WHEN THE WEATHER PERMITS WE SPEND A GREAT DEAL OF TIME OUTSIDE. I THINK YOU WOULD BE VERY HAPPY WITH THE CARE THAT I PROVIDE. MY BACKGROUND CHECK IS AVAILABLE UPON REQUEST AND I HAVE MANY GREAT REFERENCES FROM PARENTS AND NOW EVEN CHILDREN I HAVE CARED FOR IN THE PAST. I WOULD LOVE THE OPPORTUNITY TO MEET WITH YOUR FAMILY AND DISCUSS THE POSSIBILITY OF ME HELPING YOU WITH YOUR Childcare NEEDS. WE CAN DISCUSS DAILY, WEEKLY AND EVEN MONTHLY RATES UPON CONTACT. FEEL FREE TO TEXT OR CALL ME AT 586-864-... FOR ANY QUESTIONS YOU MAY HAVE OR IF YOU WOULD LIKE A LIST OF REFERENCES. THANK YOU FOR TAKING THE TIME TO READ THIS AND I HOPE TO HEAR FROM YOU IN THE NEAR FUTURE. Hi! I am a young, healthy, 62-year-old mom of three adult daughters. I am a natural and experienced caregiver.